Assorted Body Supports Includes: 4 knee, 2 palm, 2 ankle, 2 wrist and 2 elbow supports. Great for kids of all ages, this 40-piece Fun Color Bandages Set features highly absorbent bandages with non-stick pads. 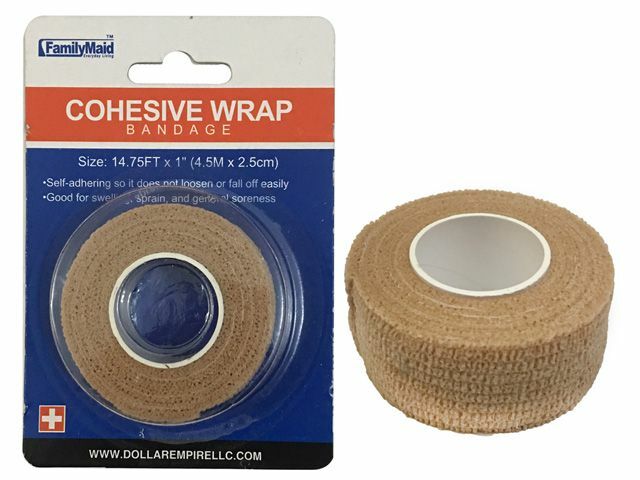 Bandages are latex free and made of soft, flexible plastic. Each pack comes with 40 bandages - 8 each of the following colors: orange, blue, purple, green and yellow. Each bandage measures approximately 3/4 x 3. Comes packaged in an individual box. Box measures approximately 3 x 1.5 x 4.5.
one size fit all, for man and woman. Designed to provide compression and support for stiff, weak or injured joints, these Elastic Calf and Knee Support Braces help provide protection from further injury. There is 1 brace per package. Braces are available in blue only. Comes in assorted styles: calf and knee. One size fits most. Braces are packaged individually in hanging boxes. Box measures approximately 3.5 x 1.125 x 7. A good protection to your calf,knee or thigh,ensure the security of the exercise.